Galerie Quynh is pleased to present UuDam Tran Nguyen’s first solo exhibition with the gallery. The artist will premiere in Vietnam the acclaimed installation Rồng Rắn Lên (Serpents’ Tails), which comprises a three-channel video, sculpture, photographs, and an immersive installation of motorbikes whose exhaust systems inflate, feed, and give flight to tubular “serpents” sewn together from disposable plastic bags. In Nguyen’s metaphor, man wrestles with the by-products of his industry, which continue to wreak environmental imbalance and destruction. Serpents’ Tails has already toured esteemed venues in Singapore (Esplanade), Japan (Body/Play/Politics at Yokohama Museum of Art), and Australia (Asia Pacific Triennial 8 at Queensland Art Gallery | Gallery of Modern Art). From Hindu and Greek mythologies to the Bible and Vietnamese nationalist stories, the inspiration for Serpents’ Tails is manifold. The 15-minute, 3-channel video begins with the creation of homemade objects and snaking animals that are breathed into life by the toxic fumes emanating from motorcycle exhaust pipes – that which gives life can also extinguish it. In one chamber, a giant elephant inflates and bloats into form against the floor, walls, and ceilings (replicated at Galerie Quynh). Pollution, and by extension environmental disaster, is the ignored elephant in the room that has been given shape by Nguyen’s plastic skins. The funny, not-so-funny caricature inhales and nearly bursts with a poison that remains formless and invisible to the casual eye in Saigon, where motorcycles numbering 7+ million nearly match the number of its inhabitants. In other scenes filmed on rooftops and dark fields encircled by motorcycles, these tubular serpents, which now have a wild life of their own, wrestle physically with dancers in pas de deux that is at once conflictive, beautiful and tragic. In Virgil’s Aeneid, the priest Laocoön warns his Trojan countrymen of the suspicious giant wooden horse gifted by the Greeks, to no avail. In retaliation, the goddess Athena sends two sea serpents to kill him and his sons. Like blatant wisdom and climate science that goes dismissed, the dancers in Serpents’ Tails writhe and struggle to quell the beasts that ultimately come for us all, leaving nothing but carbon footprints behind. Later, adorned in facemasks, helmets, and sun-protective clothing, 44 riders and their motorcycles move in rectangular unison, as their literally exhaustive, toxic serpents drape over, veil, and even choke them. Barely able to see their way but gracefully maneuvering through the streets on “iron beasts,” the sequence is reminiscent of Thanh Giong, the legendary saint who rides on an iron horse and saves the Vietnamese kingdom from foreign invaders. A folktale common to schoolchildren in Vietnam, Nguyen’s adaptation is not one of heroism over imperialism, but a cautionary tale that pleads for serious environmental action over fictitious action heroes. Composer An Ton That’s jarring, industrial and alien soundscape that accompanies Serpents’ Tails reiterates the idea that the true “space invaders” are much more difficult to recognize and the battle is even more dire. 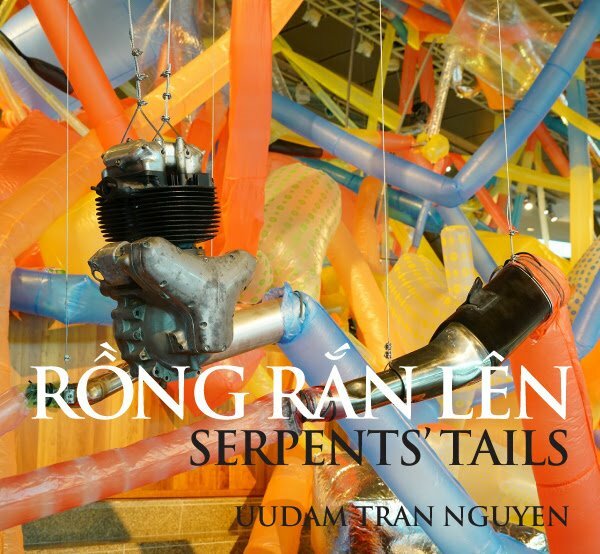 Nguyen’s encompassing framework at Galerie Quynh for Serpents’ Tails, which is staged over 4 floors and up to the roof, alludes to the overwhelming problem faced by fast, modernizing countries like Vietnam. From level to level filled with sculptural props and objects belonging to the vast project, the spectacle of ambition and building “forever-up” is hammered home. In the video’s final sequence that harks to the hubris misguided ambition that built the Tower of Babel, numerous motorbikes and serpents festoon from ground to the roof of a tall brick building. A dark storm moves through and the serpents break free from their pipes and plastic vessels – dispersing, metamorphosing, and enveloping the environment. Ill-conceived construction ultimately begets collapse, and this apocalyptic narrative, as taught through the lived experiences of millions, is not just another serpent’s tale. UuDam Tran Nguyen (born 1971, Saigon, Vietnam) earned his MFA from the School of Visual Arts in New York (2005) and BA from UCLA (2002). He also attended the University of Fine Art in Ho Chi Minh City for three years prior to his studies in the U.S. His various projects engage with geopolitics, the environment, and issues of security and collaboration. Employing traditional media as well as crowdsourcing apps and other new technologies, Nguyen’s distinctive body of work bridges the east-west, local-global divide in a way that confronts the pressing issues and complexities of broad, modern life in Southeast Asia and beyond. Nguyen has been included in prestigious exhibitions internationally such as UuDam Tran Nguyen: TIME BOOMERANG California Edition – From S.E.A. Sea Atolls to the Next Dead Stars, Orange County Museum of Art, Santa Ana, CA, USA (2019); Shanghai Biennale, Power Station of Art, China (2019); So Far So Right, Kuandu Fine Art Museum, Taipei, Taiwan (2018); Sunshower, Mori Art Museum and The National Art Center, Tokyo, Japan (2017); Aichi Triennale: A Rainbow Caravan, Aichi Art Center, Japan (2016); Body/Play/Politics, Yokohama Art Museum, Japan (2016); Fiesta Mobile, The High Line, New York, USA (2015); Mien Meo Mieng Contemporary Art from Vietnam, Bildmuseet, Umea University, Sweden (2015); Asia Pacific Triennial 8, Queensland Art Gallery | Gallery of Modern Art, Brisbane, Australia (2015); Waltz of the Machine Equestrians, Asia Society, New York, USA (2014); and Singapore Biennale, Singapore Art Museum (2013). His works are in the collections of Queensland Art Gallery | Gallery of Modern Art (Brisbane, Australia); Kadist Art Foundation (Paris, France / San Francisco, CA, USA); Asia Society (New York, NY, USA); and MAIIAM Museum of Contemporary Art (Chiang Mai, Thailand).